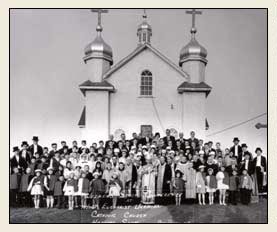 Between 1897 and 1914 a steady stream of Ukrainian immigrants left Ukraine and settled in Saskatchewan. By 1901, blocks were formed around Wakaw, Hafford, Yorkon, Meath Park. Lemberg and Edenbridge. Others followed as more railway branch lines opened. The lands to which they came held promise. In contrast to dire need in Ukraine, there was room for initiative and an opportunity to own land. 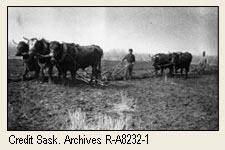 The rich loam of the prairies resembled Ukraine’s chornozem (black earth) and there were plenty of trees for fuel. 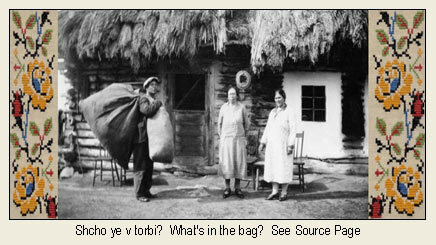 These “immigrants in sheepskin coats” known as Ruthenians or Ukrainians, or by their regional roots-- Galicians, Bukovinians, Volynians, Lemkes and others--brought with themselves a valuable treasury that went far beyond their settlers’ trunks. 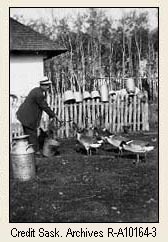 Used to hardship and toil, their innate qualities of character and drive would, in time, be applied to every area of endeavour in Canada: politics, science, literature and the visual arts, where they would leave strong marks of success. In their new surroundings, their passion for music, intricate needlework, pysanka decoration and dance would take new creative forms of development. Although the original burdai (the soddy) and many of the clay and log houses of yesteryear are no more, their onion-domed churches and bell-towers remain a valuable legacy of their built heritage, frequently resurfacing in modern architectural adaptations. 'Tri dnya ne yiezh, nu visela bud’ (do not eat for three days but be cheerful) reflects the hard reality of pioneer experience, the scarcity of provisions in the early years. 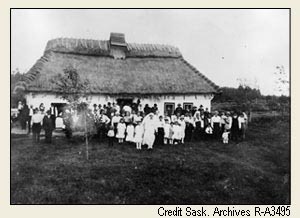 Staying bright and cheery even in desperate times was a desirable quality exhibited by many of the Ukrainian pioneers whose lives have enriched farm communities, our prairie towns and cities. This is the legacy of the soul of the Ukrainian settler: ingrained good humour, resilience and high energy for which it is known, and a penchant for celebration, either serious or light. 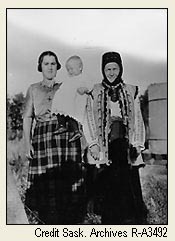 These qualities, combined with the love of education and ethic of labour exhibited by Ukrainian settlers, have contributed much to that unique combination of virtues and talents underlying our modern Canadian ethnography. 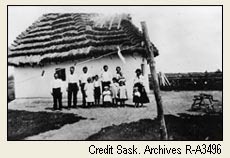 This exhibit focuses on the archival holdings of member archives of the Saskatchewan Council for Archives and Archivists—their manuscripts, photographs, documentary art and correspondence—reflective of the theme of combined ethnic virtues and Saskatchewan’s Ukrainian legacy.